Abstract: Objectives: This study aims to measure the implementation and compliance of appropriate statin therapy among uninsured populations with elevated ASCVD risk scores and demonstrate the health disparity and need for better education regarding statin adherence. Methods: The data for this study was extracted from medical charts of patients that were being managed in nine free clinics in Tampa Bay between January and December of 2016. Results: Only 17.1% of diabetics being managed in free clinics in 2016 were being treated with the appropriate statin therapy. 63.6% of the diabetic patients were considered to be at high risk for ASCVD based on their estimated 10-year ASCVD risk scores. 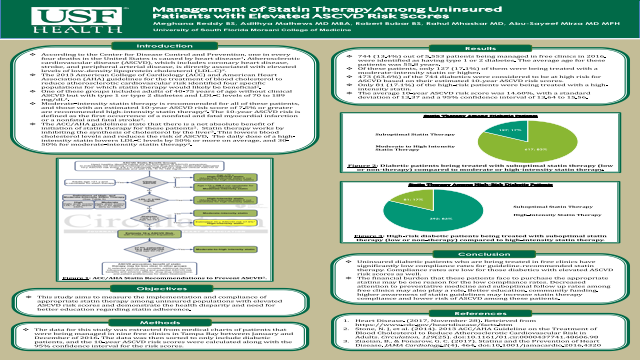 Only 17.1% of these high-risk patients were being treated with the appropriate guideline-recommended statin therapy. Conclusion: Uninsured patients with high ASCVD risk scores who are being treated in free clinics have significantly low compliance rates for guideline-recommended statin therapy. Better education, community funding, higher awareness of statin guidelines may increase statin therapy compliance and lower risk of ASCVD among these patients.